Michigan Enhanced Drivers License is a legal document that serves as an identification and helps meet your border-crossing needs. It is a federally approved document that allows you to re-enter the U.S. when traveling by land or sea from Canada, Mexico, Bermuda, and the Caribbean. You must have no violations, suspensions, revocations or denials on your driving record that would prevent you from legally operating a motor vehicle. Click the link for a complete list of the Documents Required for an Enhanced License. Documentation is subject to Department of State approval. Document approval may occur on the same day otherwise, a second visit will be required. When applying for an enhanced Michigan drivers license, your first and last name and date of birth on your identity and proof of citizenship documents should match. If they are different, you must submit legal documents showing proof of a legal name change. After you complete the enhanced license application process, you will be issued a Temporary Operator’s Permit to drive. The operator’s permit does not qualify as a secure document for border-crossing purposes. Your enhanced license is valid for up to four years and should arrive in the mail within two to three weeks. Finally, all Michigan drivers license has to be Real Id compliant by October 2020. 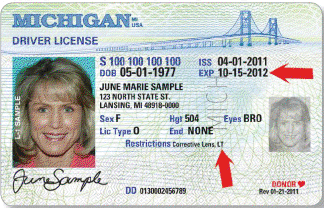 Click the link to view more information on the updated Michigan Real ID drivers license. Copyright 2019 E-Michigan Insurance | All Rights Reserved | This site is not affiliated with the Michigan government.